Our new fleet just arrived on time for the start of spring! 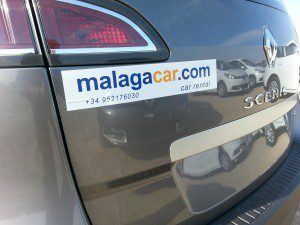 As our regular customers already know, at Malagacar.com we have an on-going commitment to provide high quality both in service and vehicles. Therefore, we constantly renew our extensive fleet. Foto: Our new Kombis: Renault Scenic, especially recommended for golfers for its large boot. For us, customer service is key and of course, satisfaction with the product we offer is paramount. As our customer arriving at Malaga airport for a relaxing and enjoyable holiday, you will not have to worry about the poor condition of a vehicle with many kilometres or its road safety etc., because even our most “seniors” cars enjoy excellent maintenance in our own facilities. And let’s face it: There is nothing better than enjoying a good customer service upon arrival and sit a few minutes later in a car that still smells new to start your holiday in Malaga. As a regular customer from your Malaga office is there any loyalty package you can do to save time when booking in at the office or price discount? Hi Gary, thanks for using MalagaCar.com.